This timeline accompanies a press release from English Heritage announcing the now-completed conservation efforts at Wigmore Castle. Norman conquest of England by William, Duke of Normandy (William I). First castle at Wigmore built by William FitzOsbern to strengthen the Welsh border as part of William the Conqueror's huge defensive building programme. The castle was probably a small one built of earth and timber. William FitzOsbern's sons rebel against William the Conqueror who seizes the castle and gives it to Ralph de Mortimer - Wigmore will remain a Mortimer stronghold until the 14th century. The castle's rebuilt on a larger scale by Ralph's son Hugh. It includes a large motte (an artificial earth mound on which the castle's main tower is erected) with an enclosed bailey (a courtyard surrounded by buildings) to the south-east. At this stage the buildings and defences are still made of timber. In 1996 a kitchen dating from this period was discovered under the present south curtain wall. 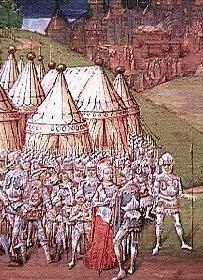 Wigmore Castle is besieged by Henry II as a result of Hugh Mortimer's support for Stephen of Boulogne. Two small earthwork castles to the east and west of the castle have survived - these were probably siege-works built for the campaign. Hugh's son, another Hugh, begins rebuilding parts of Wigmore Castle in stone - for example the earliest phase of the gatehouse and, on the motte, the walling of the shell-keep (a circular or oval structure surrounding the castle's inner portion). Hugh's grandson Ralph completes the castle in stone, building the curtain wall (a connecting wall) that surrounds the bailey. This still stands to full height on the east side and the south side between the south tower and the gatehouse. Roger de Mortimer, a notable member of the dynasty, succeeds his father Edmund. He strengthens the family's position in Wales and this prompts Edward II to imprison him in the Tower of London for two years. Edward II is deposed and murdered on Roger Mortimer's instruction. While Isabella's son (later Edward III) is still a minor Roger acts as Regent and in 1328 creates himself as first Earl of the March. To add to his stature, he rebuilds Wigmore in the form we see it today. The virtually complete chamber block at Ludlow Castle gives a good impression of what the buildings at Wigmore would have looked like at this time. Edward III succeeds his father, imprisons Isabella and has Roger Mortimer executed as a common criminal. He nevertheless allows Mortimer's grandson, another Roger, to keep Wigmore. As second Earl of March, Roger becomes a trusted royal servant. He has his grandfather's sentence reversed and inherits all the Mortimer estates which have increased through dynastic marriages. His son, Edmund, third Earl of March, marries Edward III's granddaughter Phillipa. The fourth earl, another Roger, inherits at the age of six, and is declared heir presumptive should Richard II (his mother's cousin) die childless. Roger Mortimer is killed in battle in Ireland in 1398. Henry Bolingbroke (Henry IV) seizes the throne and deposes Richard II. Roger's two sons are held in Windsor Castle. Their uncle, Sir Edmund Mortimer, joins Owain Glyndwr in his Welsh revolt. Henry IV finally defeats Glyndwr at Shrewsbury. The Mortimer heirs are kept under 'royal protection' until released by Henry V who needs their help with his French campaigns. Edward of York (later Edward IV and also a member of the dynasty) conducts the last military action associated with Wigmore Castle. At Mortimer's Cross he defeats the Tudors and eventually deposes Henry VI. During the reign of Edward IV Wigmore Castle ceases to have any real significance and is barely maintained. It is supplanted by Ludlow as a royal castle. Queen Elizabeth I sells Wigmore to Thomas Harley of Brampton Bryan. His son, Sir Roger Harley, a puritan and Parliamentarian, inherits the castle. He leaves it in the charge of his third wife, Lady Brilliana who dismantles the castle's defences to stop the Royalists fortifying it against her. Hereford is taken from Parliament by the Royalists. Brampton Bryan is destroyed and Lade Brilliana, who had been ill for several years, dies weakened by the siege. Wigmore Castle is already a ruin, having played no part on the Civil War. The Royalist forces surrenders after Charles I's defeat at Gloucester. Excavation has revealed that there was a considerable amount of destruction and looting at Wigmore. The buildings were left roofless and crumbled through natural decay. The ruins are drawn by the Buck brothers and are shown in a state very little different from today.